We are delighted to hand you over to a returning visitor to our blog, the lovely Regan Walker who has been busy carrying out her usual, meticulous research for her latest romantic Georgian romance, Echo in the Wind (to find out more about her latest book, check out the end of this post). In November of 1782, Joseph Montgolfier, a French manufacturer of paper began to wonder if rising smoke might be used to carry a balloon aloft. 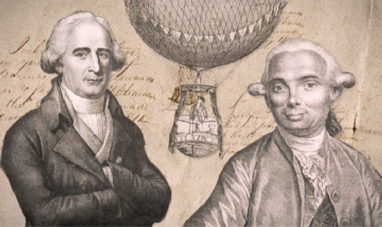 With his brother Etienne, he experimented, and by June 1783, the brothers Montgolfier built a balloon made of silk and lined with paper that was 33 feet in diameter. They launched it, unmanned, from the marketplace in Annonay, France. The balloon rose 5,200-6,600 feet and stayed aloft for ten minutes. History was made. Word of their success quickly spread. The French king, Louis XVI, who was known to dabble in science and a great friend of Benjamin Franklin, desired a demonstration. 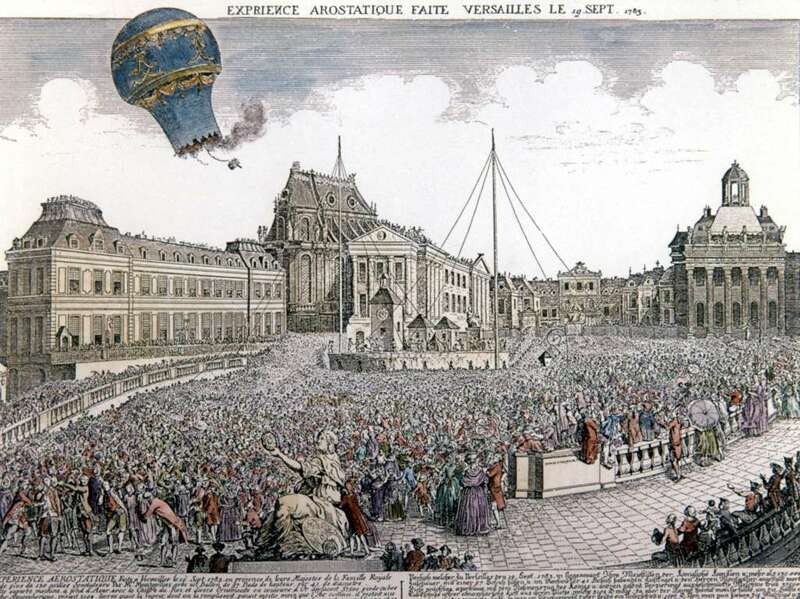 For this flight, the Montgolfier brothers constructed a balloon about 30 feet in diameter made of taffeta and coated with a varnish of alum for fireproofing. 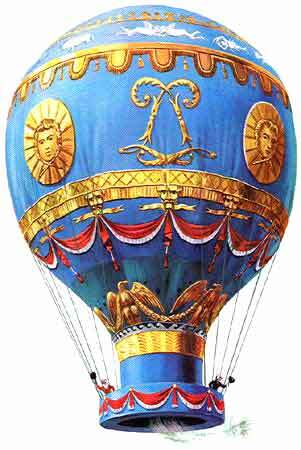 The balloon was decorated with golden flourishes, zodiac signs, and suns symbolizing King Louis XVI. On September 19, 1783, the brothers made an unmanned flight before a crowd of 130,000 at Versailles, including King Louis XVI and Queen Marie Antoinette. This flight was also unmanned. The next step, of course, would be a manned flight. The first balloon flight with humans aboard, a tethered flight, was performed in October 1783 by Jean-François Pilâtre de Rozier, a French chemistry and physics teacher, and the Marquis François d’Arlandes, a French military officer. Mindful of the dangers, Louis XVI wanted to use prisoners, but de Rozier persuaded the king to let him and the marquis have that honor. The flight was successful. About a month later, in November 1783, de Rozier and the d’Arlandes made the first free ascent in a balloon, flying from the center of Paris to the suburbs, a trouble-free journey of two hours. We observed it lift off in the most majestic manner. When it reached around 250 feet in altitude, the intrepid voyagers lowered their hats to salute the spectators. We could not help feeling a certain mixture of awe and admiration. 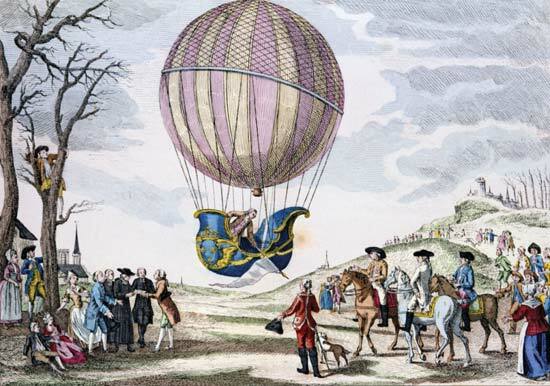 The Montgolfiers believed they had discovered a new gas (which they called Montgolfier gas) that was lighter than air and caused the inflated balloons to rise. In fact, the gas was merely air, which became more buoyant as it was heated. The balloon rose because the air within was lighter and less dense than the surrounding atmosphere, which pushed against the bottom of the balloon. The limitations of using air were soon realized. As the air cooled, the balloon was forced to descend. Keeping a fire burning meant the risk of sparks setting the bag on fire. Other methods were explored, including hydrogen. On December 1, 1783, Jacques Alexandre César Charles launched a balloon containing hydrogen from the Jardin des Tuileries in Paris before vast crowds. Jacques Charles and his co-pilot, Nicolas-Louis Robert, ascended to a height of about 1,800 feet and landed at sunset after a flight of just over 2 hours. It is believed 400,000 spectators witnessed the launch. Hundreds paid one crown each to help finance the construction and receive access to a “special enclosure” for a close-up view of the lift off. Among the “special enclosure” crowd was Benjamin Franklin, who had become quite a fan of the aerostatic globes, as he called them. 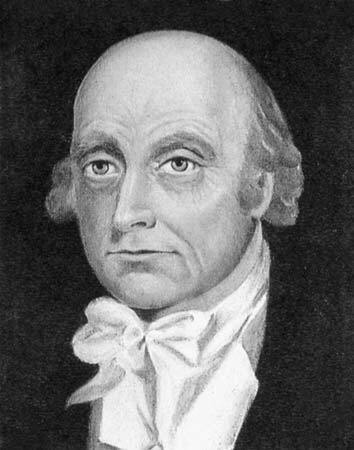 In my new Georgian novel, Echo in the Wind, this new love of Franklin’s is remembered and his thoughts at the time recalled. The first person in Britain to ascend in a balloon was a Scot, James Tytler, an apothecary and the editor of the second edition of Encyclopædia Britannica. Notwithstanding Tytler’s achievement, “Balloonomania” swept Britain due largely to the exploits of an Italian, Vincenzo (“Vincent”) Lunardi, who, quite the showman, styled himself as “the Daredevil Aeronaut”. Following in the footsteps of the Montgolfier brothers in France, Lunardi arrived in London from Italy in the early 1780s determined to demonstrate the wonders of balloon-powered flight. On the morning of September 15, 1784, nearly 200,000 people watched as Lunardi launched a hydrogen balloon into the air from the Artillery Ground on the northern outskirts of London. The envelope of the balloon was made of oiled silk, and had a diameter of 33 feet. For the flight, Lunardi was accompanied by three companions: a dog, a cat and a pigeon. A special stand had been erected for George, the Prince of Wales, who tipped his silk hat in deference as the balloon began to rise. The balloon drifted north for 24 miles before landing safely in Hertfordshire. The age of the hot air balloon had arrived and mankind was forever committed to the sky. Thanks so much for having me on the blog, Sarah! It’s always a privilege to be with you talking about all things Georgian! 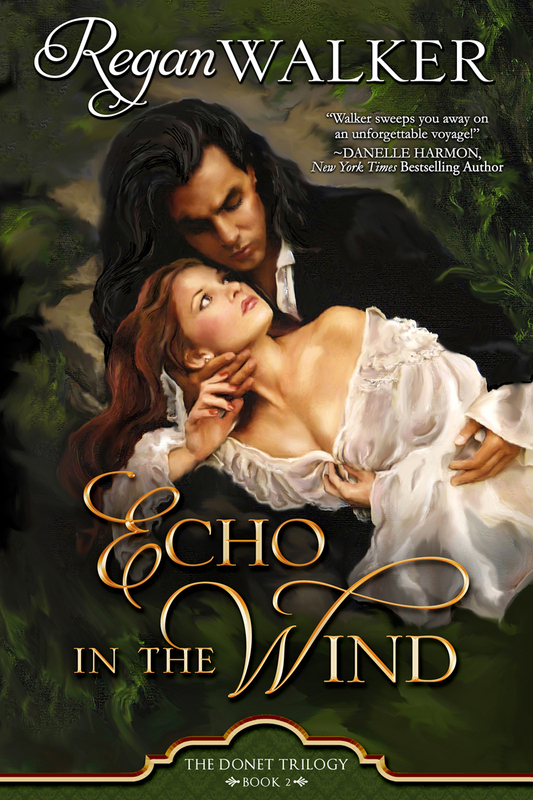 I hope you enjoy my new story, Echo in the Wind. Sarah, I posted on FB in several places and Tweeted, too (but used the picture so it may not show here). Great blog about Georgian ballooning Regan! I believe that James Sadler ‘King of Balloons’ was the first Englishman to build and fly his own balloon and that Lichfield’s own Samuel Johnson and Erasmus Darwin also showed interest and, at times, disinterest in 18c ballooning! Thanks, jonotourism. A great bit of added info. 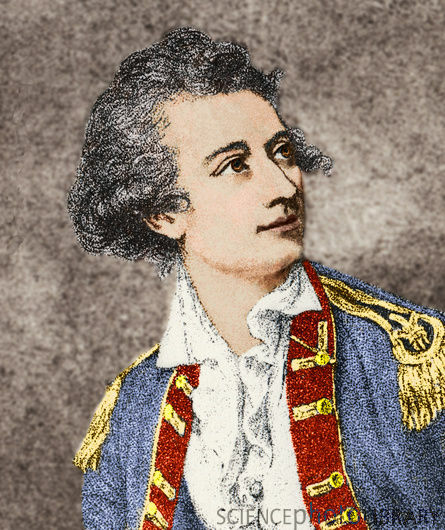 Sadler was the second person to make a balloon ascent in England after Vincent Lunardi’s flight on 15 September 1784. I understand the great Joseph Boulogne, Chevalier de St. Georges, a mulatto swordsman and violinist and some say the most famous man in France in the late 1790s. He was also reputed to be the inspiration for Dumas’ D’Artagnon in the 3 Musketeers. Do you have any knowledge of that? Chevalier de St. Georges was in the same regiment as Dumas’s father, so it’s quite feasible, but others say that D’Artagnon was based upon Charles de Batz de Castelmore d’Artagnan, the Muskateer of the Guard (1611-1673). Both seem equally viable, but unfortunately, we don’t have anything more conclusive to offer.